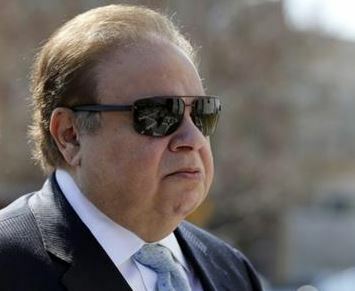 WEST PALM BEACH, Fla. (CN) – Accused of carrying on a mammoth health care fraud and bribing a U.S. senator to shield him from liability, eye doctor Salomon Melgen stared towards the witness stand as his patient records were dissected by prosecutors’ star expert. A small army of FBI agents, federal regulators and government attorneys built the sprawling Medicare fraud case against the South Florida ophthalmologist. But it was one fellow physician who stood to seal Melgen’s fate in the eyes of the jury this week at the federal courthouse in West Palm Beach. In extended testimony, Dr. Stuart Fine, prosecutors’ go-to retina specialist in the case, testified that Melgen’s patients appeared to have been diagnosed and treated for wet macular degeneration despite a complete lack of evidence that they were suffering from the eye disease. Fine said he had reviewed Melgen’s medical charts from a sample group of roughly 30 patients. The diagnoses, the treatments and the eye drawings that appeared in the charts rarely, if ever, reflected the actual condition of the patients’ eyes, Fine testified. Though past imaging tests for one patient showed that her macula was “completely normal,” Fine said, Melgen’s records indicated she had macular degeneration and was treated with expensive Lucentis injections. In another case, a patient with one eye puzzlingly wound up with diagnostic notes on two eyes in Melgen’s chart, according to the testimony. Prosecutors allege Melgen billed for bilateral diagnostic procedures even though the man had a prosthetic in his right eye socket. According to Fine’s testimony, the medical records further suggest Melgen ordered pricey ultrasound evaluations on patients when there was no medical need for them. On cross examination, Melgen’s defense team portrayed Fine as an ivory-tower professor whose interpretation of the patients’ past angiographies and retinal photos would naturally be different than that of a typical clinician such as Melgen. The defense — rather than peck at Fine’s stature and credibility — readily held him out to be one of the country’s leading ophthalmologists, in effect arguing that his testimony about the patient records was not evidence of fraud on Melgen’s part, but of Fine’s ability to discern what Melgen perhaps could not. The strategy was in line with the defense’s previously asserted position that while Melgen may have made occasional diagnostic mistakes, he is no fraudster. During a heated exchange, Melgen’s attorney pressed Fine on whether it was fair to say he and Melgen occupied “different worlds,” to which Fine eventually responded, “Okay … Yes.” The two sparred about whether Fine should be referred to as an “academic,” as Fine repeatedly insisted he was a practicing retina specialist and had decades of first-hand patient experience. The defense team went on to try raising doubts in jurors’ minds about how the 30 sample patients were picked from a pool of thousands of Medicare patients who Melgen had seen over the years. During a break in the trial on Wednesday afternoon, Melgen, who is free on bond, stepped over to his wife and briefly held her hand. With a thin white beard, and his shoulders barely poking over his chair, he appeared stone-faced amid most of the trial, frequently jotting down notes while witnesses testified. Matthew Menchel, a member of the defense team, unsuccessfully argued for a mistrial earlier this week, contending that prosecutors had, without giving requisite notice and in the face of contradictory evidence, raised allegations that Melgen billed for a medical procedure he never administered. The Palm Beach Post reported that while Judge Kenneth Marra did not honor the mistrial motion, he instructed jurors to disregard the testimony concerning the alleged phantom medical procedure. Melgen stands accused of billing Medicare more than $190 million between 2008 and the end of 2013. Of that billed sum, he and his medical practice Vitreo-Retinal Consultants received more than $105 million in payments, much of which was obtained through bogus diagnoses, unneeded treatment and other misconduct, prosecutors claim. Prosecutors say the Dominican ophthalmologist made “exorbitant and improper profits” from his use of the macular-degeneration drug Lucentis. Apart from administering Lucentis to patients who didn’t need it, Melgen would milk multiple doses from “single-use” containers of the drug and bill Medicare for each injection given, according to the indictment. In a second, not-yet-tried criminal case, Melgen faces charges for allegedly bribing New Jersey Senator Robert Menendez into advocating for him in his long-running dispute with the Centers for Medicare and Medicaid Services over his Lucentis billing practices. Sen. Menendez, who is charged alongside Melgen, allegedly communicated with top officials from the CMS and pushed them to ease up on a 2009 clawback order directing Melgen to pay back millions of dollars that Melgen had billed Medicare. Melgen gave Menendez rides on a private jet and let him vacation at the doctor’s villa in the Dominican Republic in exchange for Menendez’s political favors, prosecutors allege. Melgen’s legal woes do not end there. At least nine patients have filed civil claims against Melgen, as far back as 2014 and as recently as this month, saying they suffered vision loss or blindness due to infections from bacteria-contaminated injections of Lucentis and Avastin which they received at Melgen’s office in 2013 and 2014. Echoing the accusations in the criminal cases, several of the civil complaints say Melgen ordered the repackaging of Lucentis vials into multiple doses in a bid to increase his profits. In doing so, the complaints allege, Melgen ignored manufacturer guidelines and the Centers for Disease Control’s warnings to the medical community that compounding the drug could cause it to become tainted with microbes prior to injection. Melgen has maintained that multi-dosing from Lucentis vials was common practice among ophthalmologists. He and his medical malpractice insurer blame the alleged contamination on Eastern Pharmacy, which repackaged Lucentis for him before halting its sterile drug operations in early 2014. Eastern Pharmacy, a co-defendant in some of the civil cases, was cited by the FDA for “significant deficiencies” in contamination-control after tainted batches of the eye medication were traced back to its facilities.